Home » Blog » How long did it take you to fall asleep last night? How long did it take you to fall asleep last night? Are you sure? Have you ever seen someone nod off in the middle of the day, and when they woke up they swore they were never asleep? As it turns out, this is very common and sleep scientists term this experience “sleep state misperception.” Sleep state misperception is just as it sounds – perceiving oneself as awake while actually asleep. It turns out that most of us are particularly unreliable when guestimating the amount of time it takes us to fall asleep. Every morning our Sleeprate users estimate the time it took them to fall asleep. 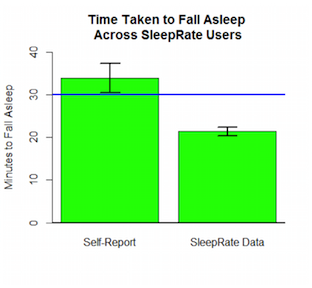 Sleeprate then utilizes a sophisticated algorithm using heart rate variability to calculate the objective time it took our users to fall asleep. Can you guess what we find? In the above graph you can actually see this data. The average guestimate of how long it took to fall asleep is much longer than the actual length of time it took these Sleeprate users to fall asleep. Taking longer than 30 minutes to fall asleep is one of the common symptoms of insomnia. Sleep state misperception occurs for many reasons. Throughout the night, our sleep cycles between the various stages of light sleep, deep sleep, and REM sleep. For more about how Sleeprate measures sleep stages and how this compares to other apps and sleep improvement services, click here. Scientists have found that about 50% of sleepers, when awoken out of light sleep, believe they were awake. If you tend to think or worry more at bedtime you may spend more time in lighter sleep than those who go to bed with a calm mind. For people who have really had a hard time getting to sleep or staying asleep, they may worry about sleep and not even realize they have actually fallen asleep! Most of us are unreliable when estimating how long it takes to fall asleep. Scientists have found that about 50% of sleepers, when awoken out of light sleep, believe they were awake. Make sure your mind is nice and calm before heading to bed and you’ll increase your odds of falling quickly into nice deep sleep!